"Created in 1888 in honor of Vladimir the Great, ruler of Holy Russia, Prince Vladimir tea is a blend of Earl Grey, citrus, vanilla and spices. It is one of our most unforgettable teas. We suggest to enjoy this tea during the whole day. Main flavor: Smooth citrus and spice." 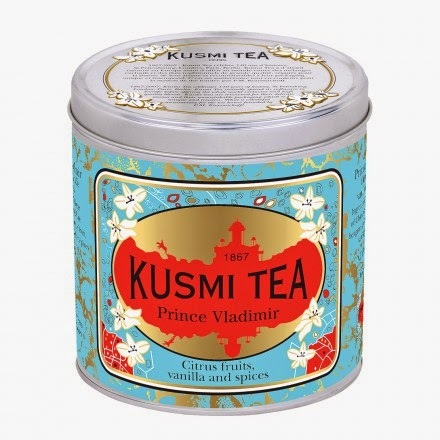 I’m a big fan of Kusmi teas, but this remains my constant favorite. Given that this is listed on their site as one of their most popular teas I am not alone in that regard. I can honestly say in all my years of tea tasting I've never experienced a tea quite like Prince Vladimir. From the initial aroma to the final brew, it is a decidedly unique tea. In fact, the first time I opened the canister in the presence of one of my friends and he had a whiff, he asked me if the contents were legal!!! Like most Kusmi teas, the final brew is very smooth with virtually no bitterness and the spices are easily discernible on the palate with or without adding sugar or milk. In my opinion it is the unique nature of this tea that is its most endearing quality (as opposed to the taste alone, which is still quite good). Its always fun keep some on-hand to expose my “non-hot-tea drinking friends” to “something different”. This is just a fun tea, period.